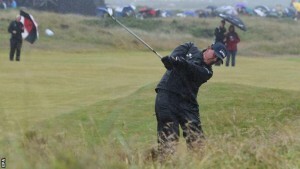 His first two rounds complete, and Phil Mickleson leads this years Open. In years past, there would be an element of uncertainty about Phil’s ability to maintain his leaderboard position. A feeling that he would find a way to sabotage his opportunity somewhere out on the course. But this Troon Open feels different. Reducing risk off the tee, by using a two iron to maximise control, has given him a sense of certainty in his game. In other words, he is pretty certain where his ball is going to go most of the time. When a player has that level of trust, then they can play with an uncluttered mind. Thinking only where best to leave the ball for maximum strategic advantage. It’s this level of quiet, calm and certainty that leads to the magical sixty-three that Mickleson shot yesterday. Nothing to fret about. Settled with his game. Tuned into the links. A harmony of player, game and the course. When you have the years of experience Mickleson has, then this can become a pretty potent cocktail of ingredients. We will know in two days time, if it’s the currency of a second Claret Jug. But right now, he is showing no signs of getting in his own way!